Heeft u een vraag voor Finders Hotel? Tijdens uw bezoek aan Taipei zult u zich snel thuisvoelen in Chaiin Hotel - Tzung Tung Fu, dankzij de hoge kwaliteit en de goede service. Het hotel ligt slechts 0.8KM van het stadscentrum: lokale bezienswaardigheden zijn dus snel te bereiken. Dankzij de praktische ligging, biedt de accommodatie eenvoudig toegang tot alle belangrijke trekpleisters van de stad. Chaiin Hotel - Tzung Tung Fu biedt vele voorzieningen om uw verblijf in Taipei zo aangenaam mogelijk te maken. Gasten kunnen gebruikmaken van de voorzieningen terplaatse zoals gratis wi-fi in alle kamers, 24-uur beveiliging, dagelijkse schoonmaak, boodschap bezorging, post service. Gasten kunnen kiezen uit 158 kamers, welke stuk voor stuk plezierig en comfortabel zijn ingericht. De accommodatie biedt talrijke recreatieve mogelijkheden, zodat u voldoende te doen heeft tijdens uw verblijf . Wat de reden van uw bezoek aan Taipei ook is, Chaiin Hotel - Tzung Tung Fu is de perfecte keuze voor een enerverende vakantie. Pros* Clean n nice room, cozy lobby with games n a session 24/7 with Free of beverage u won't go hungry.Staffs r helpful n friendly. cons* Surrounding nothing much, 10mins walk to ximending n 10 to 15mins walk to Taipei main station. Overall is Good n will stay this hotel again. Great everything especially the services ~Perfect staffs. Good location for pepper buns it’s literally across the street ;-) it is clean and accommodating. The elevators can be a drag, cause the building is shared with other tenants. All in all for a short stay a good place. Staff were great and the hotel lobby was very fun. Nice to have free snacks available any time. 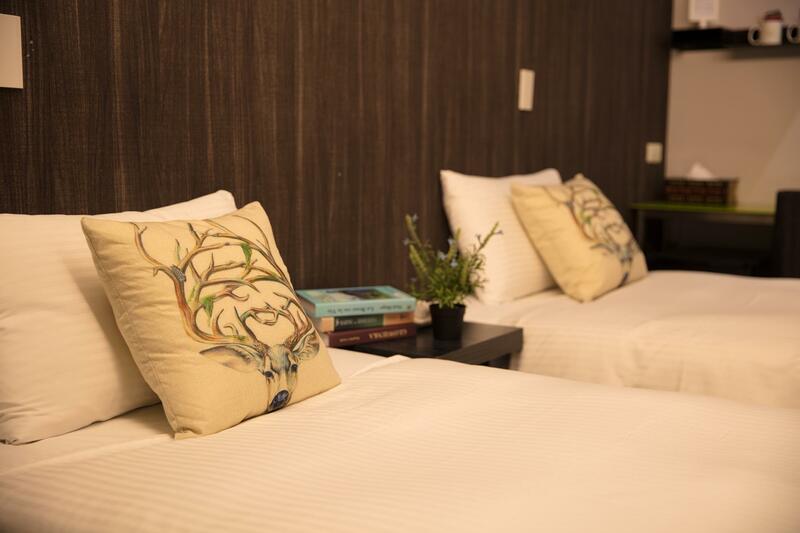 The rooms are small but clean, comfortable, and nice looking. If you need space to work or read, there are plenty of open tables in the lobby. We would have stayed here more nights if there was availability. 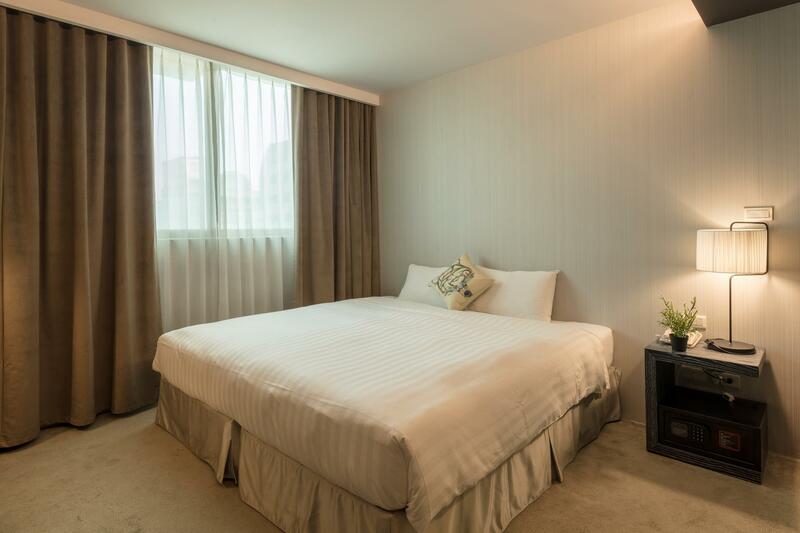 I chooses this hotel because it is near to 3 MRT stations, Taipei Main Station, Ximending and NTU Hospital. So it saves me a lot of my transportation. You can walk to all these 3 stations depending on which line you want to go. The hotel provides 24hrs cup noodles, tea & coffee and snacks. They have limited sandwiches and tea eggs in the morning. The room is abit small but is good enough. They do house keeping everyday. The room is clean. The staff is also helpful. I will stay here again if I go to Taipei the next time. Location of hotel was okay. Near to major attractions and just a 5-10mins walk away from the nearest train station. Cleaniless was excellent however room was a little small. . Hotel was expenisive but understanable as it was during the new year period. Staff was friendly. Recommeneded for travellers to stay here. Staff's friendly, polite and professional. But, what make me surprised is the decor,amenities, facilities and details of the hotel itself. The amenities are with labels using some magical words. Details & decor make you feel like in a magical world. Facilities, perfect. Got everything you can think of, and the lobby canteen offer snacks and coffee/tea/water for 24hrs, there's also a large screen showing movie. 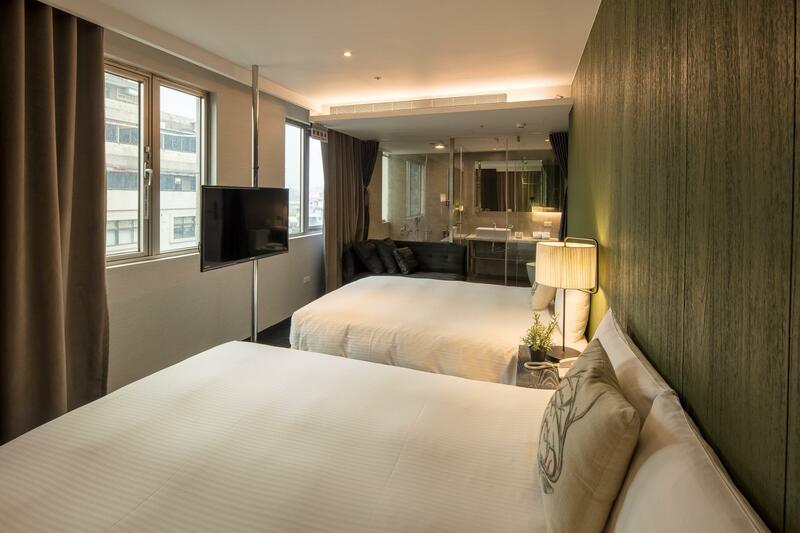 Room is, I would say, it's quite spacious when comparing with other Taipei hotels I tried with similar price. For location, it situates in the middle of 3 MRT, you need to walk approx. 10 mins from MRT station. Location is around 10-15 walk from ximending. Staff is friendly and reply our inquiry promptly. There is a kid playroom, my Daughter is enjoy it. Like their 24 hours snack service, variety of instant noodle is a lot. Have a great stay there in overall. Nice and pleasant hotel with 24 hrs free flow drinks/snacks provided for. Staff are very friendly and helpful to your needs. Room is clean though bit small. Great location as location between 2 train stations. Will stay again on returning trip. Instead of breakfast (not a must for me since there are many options available), FINDERS provide free snacks around the clock and 100 free good quality sandwiches and herbal eggs and toast in the morning. Milk tea, coffee and drinks area also available 24/7 not to mention cup noodles and popcorn. Lounge area is very inviting too. 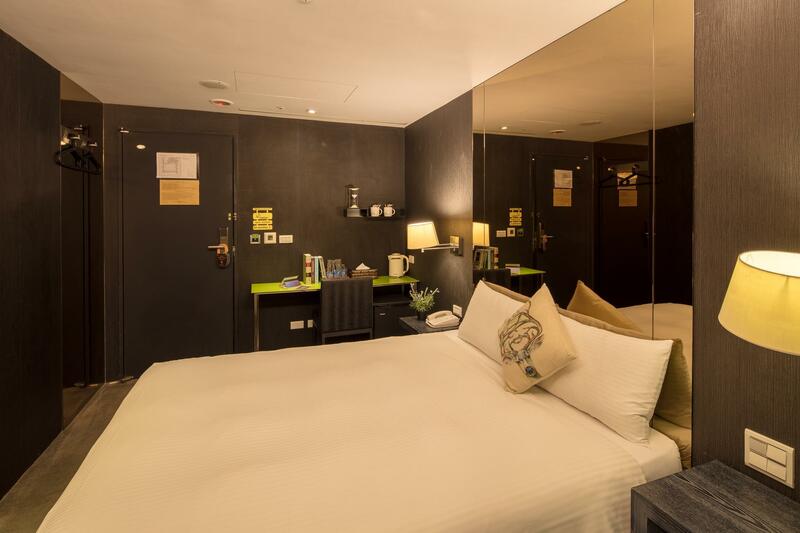 If you don't mind walking, this hotel is central to many places of interest, shops and eateries. -Location of the hotel is great! Just about 10mins walk to Xi Men Ding and Taipei Main Station, with convenience stores nearby. -Hotel room relatively small and carpet of the room definitely need some maintenance. Basic amenities were provided as well. -Staff were very friendly during check-in. Map was provided and the staff explained the routes to the nearby attractions. -Instant noodles and drinks were provided in the lobby, breakfast sandwiches were however limited to 100sets every morning and can run out fast. -Overall a great place to stay. Lift is available for all floors. The staff are very friendly and helpful on suggesting attractions around and how to go about. there are complimentary snacks and cup noodles available at lobby level. Plus point as there is a playroom for kids however suggest if it can be open earlier. Might need to look into bedbugs as my family members staying in all three rooms we booked was attacked by bed bugs. Something to improve is to include laundry room (self service). Room is very small, our room type didnt consist of windows. Cannot even open 2 luggages at the same time. But room is clean, staff is nice. Free breakfast every morning, free water in the lobby, and post cards are free of charge to send back to your own country. Located only a couple blocks from Taipei Main Station. It's a good base for site seeing in Taipei. We were able to walk to Chiang Kai-Shek memorial, Din Tai Fung, Taipei 101, and Ximen night market. The room was clean and comfortable. Lots of free snacks and drinks in the lobby. Hotel is easy to find. Central area. Near mrt stations. Staff are super helpful and nice. Basement common area is super cool! Love the vibes! We also love the free 24 hr snack bar! We we’re able to have something before we went to the airport as our flight is early. Also love the magical themed rooms, super calming. Just that there is no cabinet or space for luggage. But overall it’s a nice place to stay!